Magnets in outdoor clothing and on phone covers raise the risk of hillwalkers making navigational errors, Mountaineering Scotland has warned. The group said magnets were increasingly being used as fastenings on items such as gloves. 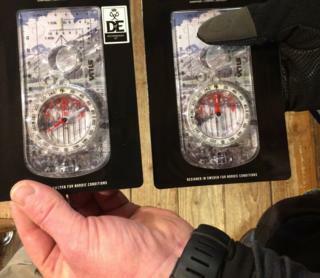 Mountaineering Scotland said a recent incident in Glen Shee was thought to have been caused by a magnetic fastening deflecting a compass needle. It said a group of walkers had wrongly headed east instead of west. They then became disorientated in low cloud and ended up miles away from a road that would have led them to safety. Heather Morning, mountain safety adviser for Mountaineering Scotland, said: "Fortunately no-one was hurt - just pride dented - but it could have turned out so much worse had mountain conditions been more severe. "The reason for the error was the compass. "It had been stored in a pocket next to a mobile phone in a case which had a magnetic closure on it, and the magnet had reversed the polarity of the compass needle, so that the north arrow pointed south." The phenomenon of reversed polarity has been publicised previously in mountaineering circles. People are advised to keep their compasses well away from mobile phones. Mountaineering Scotland said it was concerned by the growing use of magnetic closures in outdoor clothing. Ms Morning said: "Modern technology is great. The resources available now to keep us warm and safe in the mountains have never been better. "But more joined-up thinking is needed between outdoor clothing manufacturers and mountain users to avoid potentially life-threatening consequences."